Posted by rogerhollander in Africa, History, Imperialism, Kenya, Racism, South Africa, War. Roger’s note: This week, a low life scum by the name of John McCain, presiding over a Senate committee, referred to peace activists who had come to make a citizen’s arrest on war criminal Henry Kissinger, as — well, low life scum. I have always had a strong distaste for people in positions of power and authority, of whatever nationality, who are liars, racists, warmongers, etc. This goes as well for dead “heroes” who happened to be on the winning side, the side that writes history. My obsessive antipathy towards Winston Churchill began when I read about the fire bombing of Dresden toward the end of World War II, ordered by Churchill to terrorize and punish the the residents of this city that had great cultural heritage but zero strategic importance from a military point of view. This incineration of almost an entire population compares to Hiroshima and Nagasaki, and it was the inspiration for the celebrated novel, “Slaughterhouse Five,” written by an American soldier who survived the Dresden bombing, Kurt Vonnegut. If you didn’t already know that Churchill, who is considered by most to have been a noble statesman and warrior, was a disgusting racist pig, you will after reading this. This week Britain is commemorating the fiftieth anniversary of the death of Winston Churchill. Millions of people worldwide watched his state funeral on television in 1965, and thousands of people lined the streets of London to pay their last respects as his cortege slowly passed. But I somehow doubt that President Obama will be adding his own warm words of remembrance for the iconic British wartime leader. After all, his own paternal grandfather, Hussein Onyango Obama, was one of 150.000 rebellious Kikuyu “blackamoors” forced into detention camps during Churchill’s postwar premiership, when the British governnment began its brutal campaign to suppress the alleged “Mau Mau” uprising in Kenya, in order to protect the privileges of the white settler population at the expense of the indigenous people. About 11,000 Kenyans were killed and 81,000 detained during the British government’s campaign to protect its imperialist heritage. Suspected Mau Mau insurgents were subject to electric shock, whippings, burning and mutilation in order to crush the local drive for independence. Obama’s grandfather was imprisoned without trial for two years and tortured for resisting Churchill’s empire. He never truly recovered from the ordeal. Africa was quite a playground for young Winston. Born into the privileged British elite in in 1847, educated at Harrow and Sandhurst, brought up believing the simple story that the superior white man was conquering the primitive, dark-skinned natives, and bringing them the benefits of civilisation, he set off as soon as he could to take his part in “a lot of jolly little wars against barbarous peoples,” whose violence was explained by a “strong aboriginal propensity to kill”. In Sudan, he bragged that he personally shot at least three “savages”. In South Africa, where “it was great fun galloping about,” he defended British built concentration camps for white Boers, saying they produced “the minimum of suffering”. The death toll was almost 28,000. When at least 115,000 black Africans were likewise swept into British camps, where 14,000 died, he wrote only of his “irritation that Kaffirs should be allowed to fire on white men”. Churchill found himself in other British dominions besides Africa. As a young officer in the Swat valley, now part of Pakistan, Churchill one day experienced a fleeting revelation. The local population, he wrote in a letter, was fighting back because of “the presence of British troops in lands the local people considered their own,” – just as Britain would if she were invaded. This idle thought was soon dismissed however , and he gladly took part in raids that laid waste to whole valleys, destroying houses and burning crops, believing the “natives” to be helpless children who will “willingly, naturally, gratefully include themselves within the golden circle of an ancient crown”. Churchill statue in London. Photo: Getty Images. Just after World War I, approximately one quarter of the world’s land and population fell within the spheres of British influence. The Empire had increased in size with the addition of territories taken from its vanquished enemies. As British Colonial Secretary, Churchill’s power in the Middle East was immense. He “created Jordan with a stroke of a pen one Sunday afternoon”, allegedly drawing the expansive boundary map after a generous lunch. The huge zigzag in Jordan’s eastern border with Saudi Arabia has been called “Winston’s Hiccup” or “Churchill’s Sneeze”. He is the man who invented Iraq, another arbitrary patch of desert, which was awarded to a throneless Hashemite prince; Faisal, whose brother Abdullah was given control of Jordan. Sons of King Hussein, Faisal and Abdullah had been war buddies of Churchill’s pal, the famous “T.E. Lawrence of Arabia”. But the lines drawn in the sand by British imperialism, locking together conflicting peoples behind arbitrary borders were far from stable,and large numbers of Jordanians, Iraqis, Kurds and Palestinians were denied anything resembling real democracy. In 1920 Churchill advocated the use of chemical weapons on the “uncooperative Arabs” involved in the Iraqi revolution against British rule. In fact, many of the views Churchill held were virtually Nazi. Apart from his support of hierarchical racism, as Home Minister he had advocated euthanasia and sterilisation of the handicapped. Britain’s American allies saw to that in Hiroshima and Nagasaki when they dropped their atomic bombs and killed hundreds of thousands of Japanese citizens. 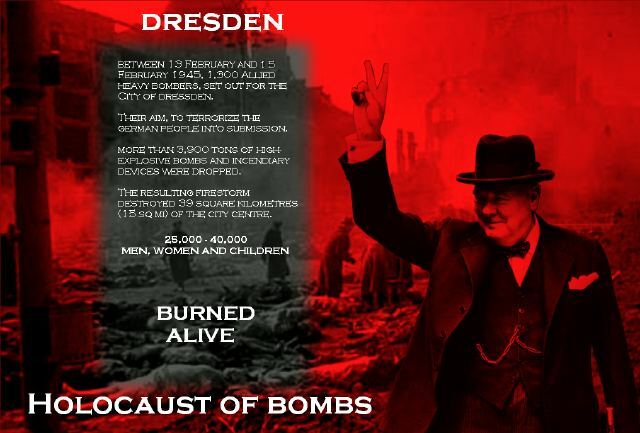 Meanwhile, Prime Minister Churchill had ordered the saturation bombing of Dresden, where, on February 13 1945, more than 500,000 German civilians and refugees, mostly women and children, were slaughtered in one day by the British Royal Air Force (RAF) and the United States Army Air Force (USAAF), who dropped over 700,000 phosphorus bombs on the city. In Dresden he got his wish. Those who perished in the centre of the city could not be traced, as the temperature in the area reached 1600 degree Centigrade. Dresden’s citizens barely had time to reach their shelters and many who sought refuge underground suffocated as oxygen was pulled from the air to feed the flames. 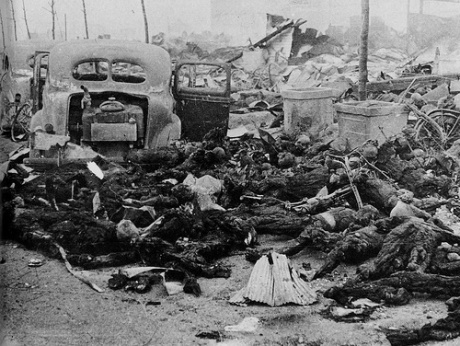 Others perished in a blast of white heat strong enough to melt human flesh. Instead of being charged with being responsible for ordering one of the most horrific war crimes of recent history, in which up to half a million people died screaming in his firestorms, Churchill emerged from the war as a hero. An unwavering supporter of the British monarchy throughout his life, he was made a knight of the Order of the Garter, Britain’s highest order of knighthoods, by Queen Elizabeth II in 1953. “The monarchy is so extraordinarily useful. When Britain wins a battle she shouts, “God save the Queen”; when she loses, she votes down the prime minister,” he once said. Shortly after the Second World War was won, however, Churchill’s Conservative government was voted down by a Britain tired of battle, austerity, and hungry for change. Churchill’s brutality and brutishness have been ignored, but he never reckoned on the invention of the internet, or its power to allow authors to question his view of history and expose the cruelty and racism of the man. When George W Bush moved out of the White House he left a bust of Winston Churchill in the Oval office. He’d used it to inspire him on his ‘war against terrorism’. Barack Obama had it removed. I wonder if he found the bust offensive? Was it out of respect for the pain and distress his Kenyan grandfather, Hussein Onyango Obama, suffered on Churchill’s orders ? Removing a bust is a fairly simple matter, but toppling a statue is quite another. In Westminster Square in front of Parliament in London there are several statues of deceased politicians and dignitaries, one of which I find particularly distasteful. Hands clasped behind back, the jodphur-clad figure striding purposely forward is that of Jan Christian Smuts. racist forefather of the Apartheid system in South Africa. His hulking toadish statue stands tall on a granite plinth, clutching a walking stick, his unblinking bulldog gaze on the Houses of Parliament where he reigned twice as a Conservative Prime Minister. If I were Prime Minister of Great Britain, one of the first things on my list would be the removal of memorials to facist-minded racist imperialists. 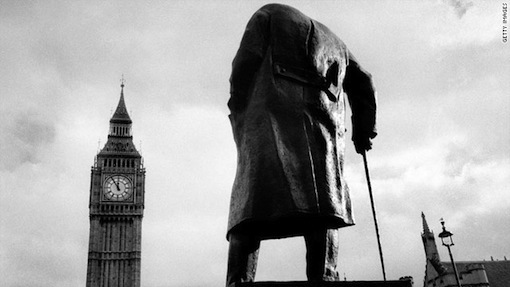 The statues of Smuts and Churchill in Parliament Square would be the first to come down.